My copy of Dungeon Crawl #1 arrived today. The format is newsletter, not booklet, as you can probably see from the photo above. 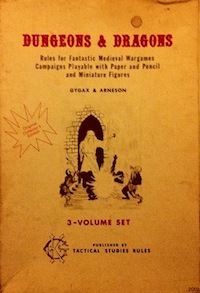 It’s full of original material: monsters, spells, traps, etc. The theme of the material is “classical alchemy” (earth, fire, water, air) and all of it is concisely written with an eye to use at the table. The last page is a dungeon. The meaning of the dungeon is mostly left to the ref. What was it built for? Why are these creatures here? These questions are not answered. This absence is not a problem, it is a prompt for creativity. My one criticism is that I would like the level entrances to be marked more clearly on the map (for example, the well entrance to location 17 is not indicated on the map at all). Also, I gather than there will be more levels in future issues, but I can’t see any exits leading down. These minor shortcomings aside, it looks like a fun adventure. What appears minimal and elegant to me may look sparse to others, so I would say this is not for everyone. In summary: lots of good ideas tied to a theme, very little fat. I’m glad to support it. This entry was posted in Uncategorized on March 2, 2012 by Necropraxis. I bought it too, there’s a trapdoor entry to level 2 in room 43. I do agree with you though that the map could definitely use entrance and exit points at the very least. Yeah, you’re right. I missed it. Thanks for the feedback, Brendan. I will more clearly mark entrances / exits on the next dungeon, it’s just that I’m still learning Dungeonographer. The “very little fat” concept is pretty central to what I want out of gaming products, so I’m glad that you agree. I probably wouldn’t have gone ahead with this project without the one-page dungeon template, honestly, because it let me work my notes into something usable by other DMs. I was just playing around with Dungeonographer, and I found that the secret doors are much easier to see on the map if you set them at 150% for both width and height.